Whether you are using paper, leather or cloth for your book cover, one of the easiest and quickest ways to give the appearance of age is to create wrinkles. Crumple up the material and use some pressure to make sure the wrinkles stay. It won't take much for paper to show wrinkles, but with leather or cloth, you may need to leave it crumpled for a few days, or use pressure, like stepping on the crumpled ball for a few minutes. Afterward, gently smooth it out. Slightly smooth over the wrinkles so they appear to have been there for a long time. Staining and discoloration is a sure sign of aging. 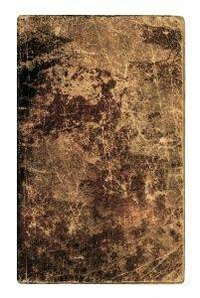 Make your book cover appear aged by adding a few stains and giving it an aged tint. The easiest way to do this is by brewing some tea and letting it cool. For deep color and stain, dip the fabric or leather into the tea and let it soak for a few minutes. You can let it dry and use it as is, rinse and then let it dry, or run it through a wash cycle so that it has only a slight discoloration. Then add some variation by dipping a cloth or cotton ball into the tea and dabbing it onto the book cover. Even with wrinkles and discoloration, your book cover will not look aged if there are no signs of wear. Create the appearance of use and wear by gently rubbing fine sandpaper or an emery board along the edges. If you are working with a paper book cover, take care not to rip the cover or sand all the way through. Pay extra attention to the corners and to the top and bottom of the spine where most wear naturally occurs, sanding them a little more than other areas.